﻿ What hampered the deployment of 40G / 100G transceiver in data center? What hampered the deployment of 40G / 100G transceiver in data center? This article will explore some practical problems and difficulties in the application of high-speed transceiver in the data center. In order to catch up with the development of new technologies such as cloud computing in a data center, we must build a high-speed traffic forwarding network. In recent years, the data center has not been limited to 10G network interconnection and has a large number of 40G connection data center intranet, data center outside the 100G connection through the general trend of development. The data center has a strong demand for the 40G/100G high-speed transceiver, but in the actual application encountered a lot of resistance, which makes the data center expansion of the pace was forced to slow down. Of course, there are many comprehensive factors: technology maturity, cost, maintenance difficulty and so on all affect the popularity of high-speed transceiver in the data center. This article will explore some practical problems and difficulties in the application of high-speed transceiver in the data center. First of all, 40G / 100G high-speed transceiver has not developed a revolutionary new photoelectric conversion technology, but by upgrading the manufacturing process, the original 10G transceiver technology to expand. In essence, for the 10G transceiver, by increasing the number of transceiver fiber to enhance the bandwidth. 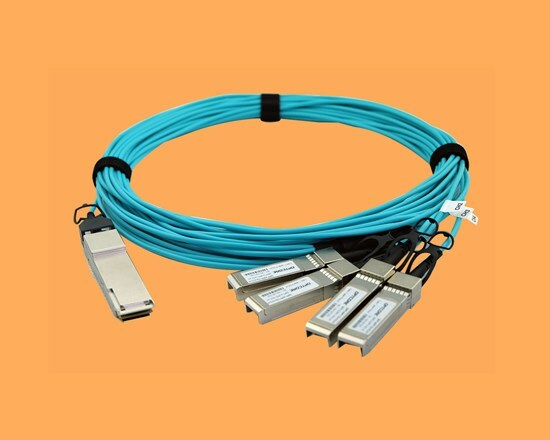 Taking 40G QSFP SR4 MPO transceiver as an example, it has internal 12 fibers, 4 receivers and 4 transmitters, there are 4 fibers to keep unused, in fact, this type of transceiver has the potential to upgrade to 60G, the existing manufacturing process can be such 12 of optical fiber integrated into a transceiver, and this 40G transceiver with the similar size like 10G transceiver, so high-speed transceiver technology is mainly in the manufacturing process. This part of the technology is still in the United States High-tech Enterprises, the purchase of their optical module price is very expensive. China’s transceiver suppliers to do high-speed transceiver started a little later, after all, their manufacturing process and international advanced still exist a certain gap. But there are also some mature products, many data centers in China have been applied, these local production of transceivers are very competitive prices, and service support is more localized. Since the high-speed transceiver is to integrate more transmitter and receiver fiber, it brings a few problems: interference problem, it is a receiving end of a transmitter, now multiple receiver terminals, technology on how to isolate or interference, so that it is easy to generate the wrong packets, when the error message packet more, it may affect the interconnection interface up/down, resulting in unstable link. Power consumption problem, 40G / 100G are in a high-speed forwarding status, high power, high heat, which requires network equipment to provide more electricity. At the same time, network equipment should also consider the issue of Port density, the distance between the ports can not be too close to affect the cooling, in order to support 40G / 100G network equipment cooling performance better. Transmission distance problem, the original 10G rate transmission distance can reach 40 kilometers, when the speed increased by 10 times to 100G, the transmission distance should be significantly reduced accordingly, multi-mode 100G transceiver transmission distance can only be less than 100 meters, even if the single mode transceiver is also about 2 km, it is clear that the transmission distance can only be used for data center interconnection, and can not meet the data center of the external interconnection, so the transmission distance also limits the popularity of high-speed transceiver applications. Second, 40G / 100G high-speed transceiver procurement costs are too high, the data center to buy a high-end network equipment 48 units 40G card does not have 48 units 40G transceiver expensive, transceiver prices much beyond the data center budget. It becomes an important part of the data center’s expansion, which is required to spend a lot of money in the data center, and the use of the high-speed transceiver will immediately increase the cost. Because of this, many data centers will delay the expansion plan, waiting for a year or even several years, the price of transceivers will gradually reduce, to the last time to go to the expansion, when the price of the module is lower and technically is more stable. For example,100G transceiver just started with CFP interface, the appearance is very heavy, and with short transmission distance, but the price is very high, and the port density is very low, just a few years was eliminated. If you spend a lot of money to buy this transceiver, Some are not worth it. High-speed transceiver scarcity determines its price is also very expensive, but believe that with the technology further mature, the price will be lower and lower, until the same as the current 10G universal use. Finally, maintenance costs are too high. The technical principle of the 40G/100G high-speed transceiver is not complicated, but the maintenance staff is still somewhat difficult to master. High-speed transceiver power viewing and 10G and other rates transceiver view is also different, to multiple channels to see, there are high-speed transceivers susceptible to link quality interference, at this time not only to see the luminous power, but also to see the dispersion, current, temperature and other parameters, so the high-speed transceiver of the working status monitoring, a lot of maintenance personnel are not clear, does not know how to analyze the positioning the problem. High-speed 40G/100G transceiver also supports split, such as split a 40G transceiver into 4x 10G ports, or split a 100G transceiver into 10x 10G ports, so that interconnection requires 1 to 4 or 1 to 10 fiber cable, these cable transmission distances are relatively short: 1 meters, 3 meters, 5 meters, sometimes the connection slightly do not pay attention to the maximum distance, or the transceiver itself does not support so far distance, in use will be a variety of strange problems. If the data center introduces these high-speed transceivers to interconnect, it needs to increase the skill level of maintenance personnel, or recruit engineers who know more about high-speed interconnection technology to improve the operation and maintenance level of data center in high-speed interconnection network environment, these will undoubtedly increase the cost of the data center, and need the data center to invest more in manpower. In any case, the development of high-speed transceivers in the data center is unstoppable. It is foreseeable that future interconnection of the data center will become increasingly high bandwidth, is bound to require a large number of high-speed transceivers. data center network from 10M, 100M, 1G to 10G, 40G rate, it only took a few decades time. The next step in the development of the data center is bound to go into the process of higher speed interconnection. Although the application, will also face a lot of practical problems, this trend has become inevitable, high-speed transceiver technology will gradually mature, and ultimately toward a more high-speed 400G, or even 1000G development.